Brushless-motor technology is all the rage within the power-tool industry with many of the new cordless power tool releases utilizing this technology, giving more power, less maintenance and longer life to cordless tools. 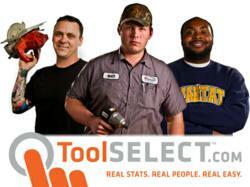 The unbiased power-tool reviews on ToolSelect.com are overwhelmingly in favor of the technology. The manufacturers are all working hard to get their customers the best possible tools, and these brushless motors are definitely what people want right now. Brushless motors are taking over the cordless power-tool industry, with just about every manufacturer either already selling brushless tools or preparing to do so. Manufacturers claim brushless motors give more power, require less maintenance and extend the life of cordless tools. Brushless motors differ from brushed motors in three main ways: computer circuitry replaces the commutator, the electromagnets are stationary and conventional magnets can move freely. Relatively new to the power-tool industry, these motors are generating interest among customers and manufacturers. Complete lines of cordless tools are being developed, and because brushless motors can generate more power than brushed motors, some tasks previously thought too tough for a cordless tool are no longer off limits. In a traditional cordless tool’s motor, the batter uses carbon brushes to conduct electricity to the commutator, which acts as an electric switch. The commutator changes the polarity of the electromagnets, which are attached to a free-spinning shaft and surrounded by fixed magnets, creating the magnetic field for pushing and pulling against. Brushless motors eliminate the wasted energy created by the physical connection of carbon brushes in a brushed motor. Computer circuitry replaces the commutator. Since the electromagnets are stationary, brushes aren’t needed to deliver power. Conventional magnets spin freely within a ring of electromagnets because they don’t require an electrical connection, thereby generating power to the tool. Some information contained herein was gathered from finehomebuilding.com. For more information (with visuals) on the inner workings of each type of motor, visit http://www.finehomebuilding.com/PDF/Free/021226018.pdf.